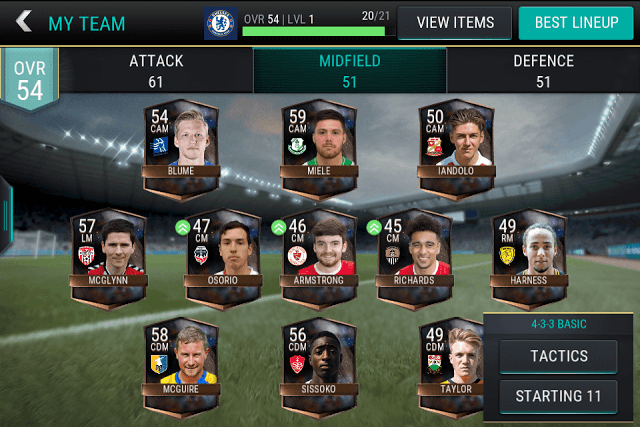 FIFA Mobile’s live events and attack mode can be called “blitz soccer”. Live events are bite-sized challenges that offer several unique scenarios, such as scoring goals, dribbling, hitting targets etc. Attack mode is a turn-based football game where you and your opponent take turns and try to score a goal within the set time limit. The game also has unique “Plans” that lets you trade players and tokens earned from live events for better rewards. Once you receive player packs or purchase a player at the Market, go to “My Team”. You may want to replace your old players with ones you just got as rewards or from the auction. However, don’t just blindly replace the older ones with new player cards. Swap only those cards that have white up arrow symbol at the top-right corner. The white arrow suggests that your current player can be upgraded and a better player is available in his place. This is one important step to building a better team, and increase your overall team rating. Now tap on your current player card and a new “Swap Player” screen will shown your devoice. New player(s) will be shown at the bottom. If there is more than one card, then you choose the best one from the cards on the bottom. The number shown at the top-left corner of each card shows the overall rating of the player. Choose the one that has better overall stats than your current player. Now when you drag the new player card on the empty swap slot, you will notice that some or most of the numbers of the player attributes have turned green, suggesting that the new player’s attributes are better than your current attributes. Live bidding at the marketplace will let you bid for the best soccer players from around the globe. You cannot place bids on players that have a “Pending” status or sold players. Tap the refresh button from time to time to check if there are any live biddings going on. A player who can be bought will have a timer. Quickly tap on such a card to place a bid. If you don’t have the patience, then press “Buy Now” button, but I would not advise you to do so as the purchase price will usually be higher than the bid price. Before placing a bid, check whether the player you are going to bid on has better attributes than the player in your collection. 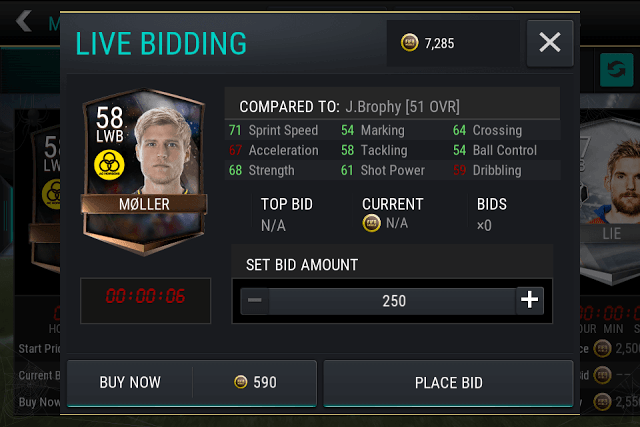 You can clearly see the player attributes comparison chart in the “Live Bidding” window. If most of his attributes are in green, then you are good to go. In the screenshot below, the LWB player is being compared to J. Brophy almost all numbers are shown in green. Also, look for players that cost fewer coins and have better overall stats. If you are playing Attack mode or the Season mode, then leave player control to the AI. It controls your players pretty well, especially when it comes to ball possession and passes. You can occasionally step in by pressing the “Sprint and Skill” button in dire circumstances. Season mode can be tough and so you would probably need a better team having a minimum overall rating within the 60-70 range. You can check your team’s overall rating by tapping “My Team”. Your team’s “OVR” can be seen at the top-left corner of the game screen. 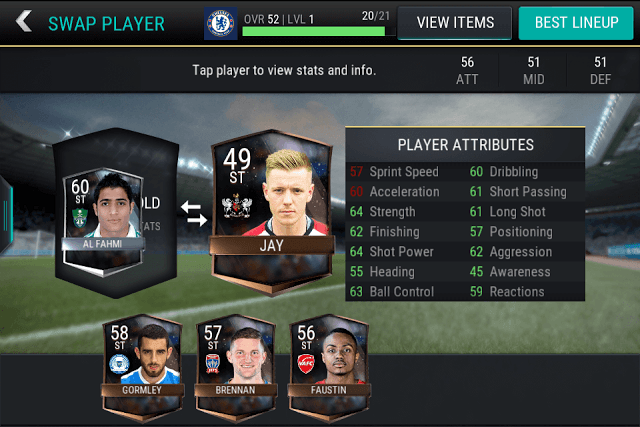 FIFA Mobile offers two control schemes: Tap and Button controls. The former involves passing the ball to a player by tapping him, swiping towards the goal to shoot. Buttons give you more control over your players as you can dribble by moving the D-pad, press the pass button to pass the ball automatically to the nearest player, and most importantly press the “Sprint and Skill” button to see your player sprint and show off special moves while tackling or moving the ball around the field. You may choose a control scheme of your choice, but using a combination of both buttons and taps can really help you control your players better and score more goals. I prefer using the virtual D-pad and the pass button while controlling my players and then I swipe towards the goal. You can try this combo or choose your own button-tap combination that makes it easier for you to control your team. Complete the “Daily Warm-Up” challenge to get a Daily Warm up pack. But you should complete the challenge in the first attempt to get it. Complete the Training Grounds challenge to get an All-Pro pack. You should win the challenge in your first attempt to get it. The Training Grounds challenge unlocks when you complete the “Training” plan. To complete the training plan, you will have to earn training tokens, which you can get by completing “Drills” live event. Complete a Drills challenge to get the Drills First Win Pack, which contains a random player and a training token. Make sure you win the challenge on your first attempt to get it. Complete the “In Form Players” live event to get a player on first win. Reach Level 10 to unlock “Champions” live event and complete the challenge to get a Champions pack (on first win). Complete Team Heroes live events to get tokens, which can be used in “Team Heroes” plans. Live events keep changing, so keep an eye on new events every day. Try to complete live events, especially those that offer player packs or individual players, before the expiry time runs out. 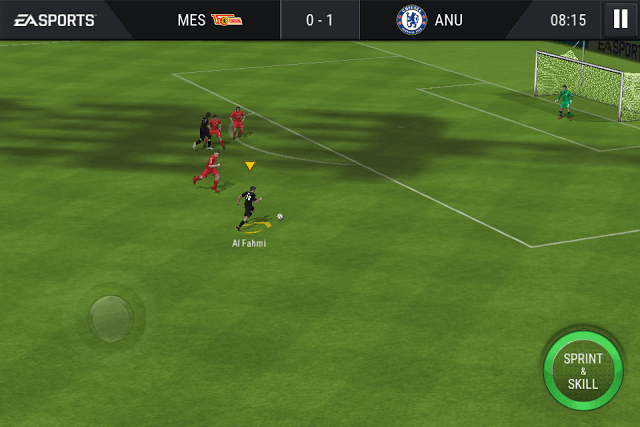 FIFA Mobile’s Attack mode provides asynchronous football matches where players take turns to score goals for their clubs. Attack mode is the quickest way to earn XP and coins, as well as fans. XP is crucial to level up, which unlock tactics and increases the Energy cap. Try to score as many goals as possible when your turn comes. A goalless session won’t earn you any XP, coins or fans so try to score at least one goal to get rewards. When you challenge a player, it’s you who will play first. Tap on a player’s club icon and then tap the play button to start a match. When the match starts, leave it to AI to control your players. Chances of scoring a goal are more with AI in control of your team. Use a combination of stick controls and taps/swipes if you are controlling your players. A swipe towards the goal can be more effective than pressing the shoot button. Remember that the faster you swipe, the more powerful your shot.